Big Dog Demolition continues to assist in the redevelopment of Uptown Charlotte with the demolition of The Center City Inn on West Trade Street. 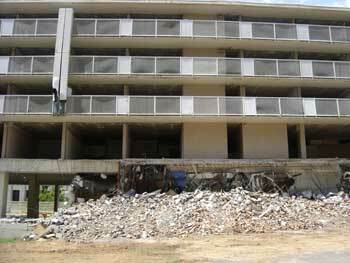 The five-story concrete structure is being completely demolished for David Furman-Boulevard Centro Development. Our scope for the 140-room, 50,000-square-foot Inn included three excavators performing the heavy exterior and structural demolition, extensive concrete saw-cutting including the interior stair towers. One of Charlotte’s newest residential high-rise buildings, The Trademark, will be constructed on the site beginning this Fall.